Bowling Green State University presents a new building that is not just for art but also surrounded by art, both inside and outside. The Wolfe Center, with its unique architectural and interior design, stands where the Saddlemire Student Services building used to be. The construction, which began October 2009, opened on Dec. 9, 2011. The 93,000-square-foot building was completed below the planned budget, according to Ryan Miller, BGSU project manager. Snøhetta, an international architectural firm based in Oslo, Norway, designed the building. The Wolfe Center is the first project Snøhetta has completed in the United States, before its 9/11 museum in New York opens in 2012. The view of the Wolfe Center from the parking lot looks like a rock coming out of the ground behind it, and most of the structure is made of glass. The wall of the lobby is covered by “The Eternal” mural a 30 feet by 80 feet mural by Anne Senstad. "The Eternal" 30 feet by 80 feet mural by Anne Senstad covers the wall of the lobby. Photo by Ugomma Ihejirika. The mural is actually a photograph of the horizon that was blown up over 1,000 times, according to the press packet. The lobby is decorated with modern furniture. Photo by Ugomma Ihejirika. Furniture in the form of a cross, and waves are also used to accent the lobby, with waterfall like railings. The furniture was purchased from Allermuir in Toledo. And the natural light flooding into the building highlights the mural on the wall. 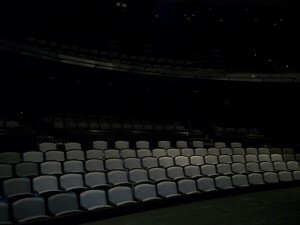 The building comprises several classrooms, offices, computer labs, dressing rooms, costume storage and shop, and the main attractions: the Eva Marie Saint Theatre and the Thomas B. and Kathleen M. Donnell Theatre, which seats about 400 people. “It is the most expensive room in the center,” said Ron Shields, chair of the theater and film department at BGSU. “Thomas B. and Kathleen M. Donnell Theatre was designed as a high quality room, in the style of the great Broadway halls found in New York and London,” according to Snøhetta’s website. 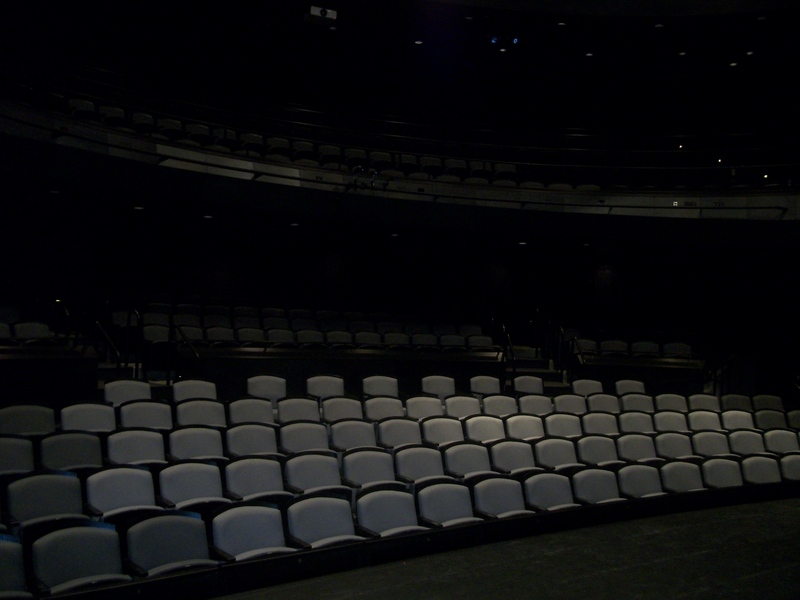 Thomas B. and Kathleen M. Donnell Theatre is the most expensive room in the Wolfe Center. Photo by Ugomma Ihejirika. The theatre was built in a horseshoe form with the illusion that there are three balconies, but there is actually just one seating balcony. Above it is the tech area, where the light and sound is handled. “This is the first building where the theaters were designed to be theatres,” Shields said. The previous theatre, Joe E. Brown, which was located on the first floor of University Hall, was a basketball court. 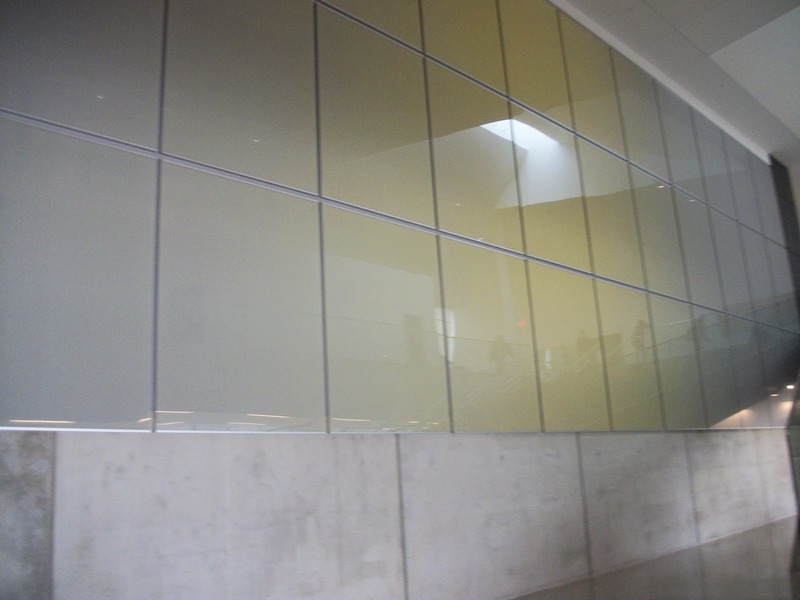 Behind the scene of the Wolfe Center is the “hallway called ‘the arts highway’ because that the south door faces the School of Art and the north door faces the College of Musical Arts,” said Shields. 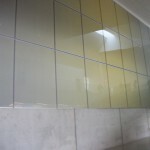 The colors utilized in the building were on the neutral side with black, white and grey flowing throughout the building. Even the bathroom walls are covered with black and white tiles “because the design architects believe that the performers should add the colors,” Miller said. The Bowling Green community, including faculty and students are excited about this new building that is one of a kind, and putting Bowling Green on the map. “It is exciting to be in a new building,” said Joe Frasher, a senior digital art major from Parma, Ohio who has four out of five classes in the Wolfe Center. The University hopes that it would be able to attract more theatre and film majors than it has in previous years. This entry was posted on Wednesday, February 1st, 2012 at 11:35 pm	and is filed under BGSU, Spring 2012, Student Contributor, Wolfe Center. You can follow any responses to this entry through the RSS 2.0 feed. Both comments and pings are currently closed.